Spoooky Sushi is a VR game about tallying up stacks of conveyor belt sushi plates at a sushi joint for ghosts. When the customers finish their meals, the player must teleport to their tables (you cannot just walk up to the tables, yay deadlines) and do quick mental math inorder to select the correct price from the Add-O-Matic tablet. Doing this fast will earn you the most tips. 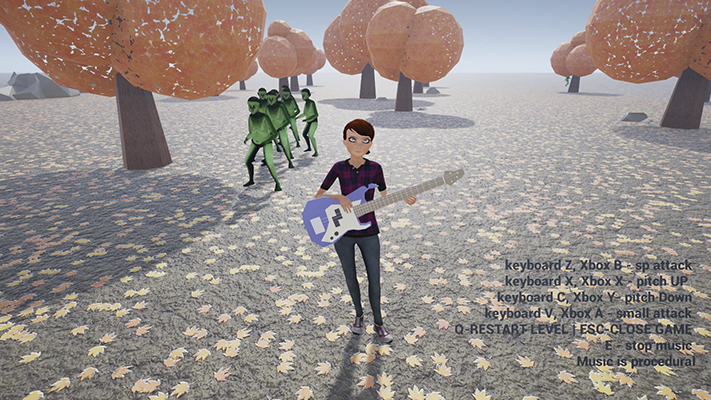 The idea, design, code, art and music were all done within the time-frame of this jam with the exception of the soundFX(Arcadia) and the VR Hand (Hands for VR: Basic) both purchased from the Epic store. Last edited by Spectronaut; 10-13-2016, 02:45 PM. For generations the conflict between the two races has caused people to stand against each other. There is only one way to solve it Once and for All - the future lies in your hands, gamer! Steer Mighty PC and try to survive the invasion of Consoles! Remember - flexibility and ability to upgrade is your power! Last edited by Nox_A15; 10-13-2016, 03:17 PM. This is the story of an epic battle between musicians, taking place in Ronald Dumps' bathroom. The winner gets to create the score for Wailing Ninja’s next video game masterpiece. This is a local multiplayer game. Controllers and minimum 2 players are required. 4 can play! Probably. We found a toilet, and we liked it. The Story is based in a mice family that was been murdered, the only survivor was the Father, he previously was a marine now full of rage and full of regret he went to find the murderer of his family, a cat. The cat hideout was the jail of in Town, full of corrupted police dogs and villains. Now is time to Settle The Score! Unfortunally the game is not finished jst a concept but we look forward to it, because thanks to it we learn a lot. Pre-made Content: Monster Audio Effects were downloaded from soundbible.com. Last edited by VHDT10; 10-13-2016, 03:11 PM. was created outside the jams time-frame. Last edited by PeterJaschkowske; 10-13-2016, 03:32 PM. Materials from Starter Content and AutomotiveMaterials. P.S. I've should have start earlier. This was my first jam and there was so much more I wanted to do but couldn't figure out! The game is set in a future mars and your job is to settle the planet. Overview: Settlers of the Score was intended to be a game where the player escorts a train of wagons and gathers resources in order to create settlements on fonts of musical energy. Due to our misjudging the submission deadline, the game is unfinished and you can't actually win or lose. Last edited by MonolithCode; 10-13-2016, 03:57 PM.